If your basement seems a bit dull, take a look at the ways you can liven the place up by creating texture and adding stone. Natural stone absorbs sound and provides a unique look wherever it is used. Whether you decide to build a stone fireplace, construct a stone accent wall, or simply add a granite counter top, the stone you choose will become a focal point for you and your guests to enjoy. Are you interested in a type of stone that creates a soft look? Would you like design variations in every stone? Do you want stone with a non-skid surface? Pick coral stone. Quarried from ancient seabeds, coral stone is composed mainly of calcium carbonate and marine fossils. Some of the fossils are more than 65 million years old. Do you want a soft stone that can be easily shaped? Take a look at both limestone and sandstone. These stones come in a variety of colors and are adaptable to many uses in interior design. Would you like stone that has a shiny, polished look and a dense, hard surface? 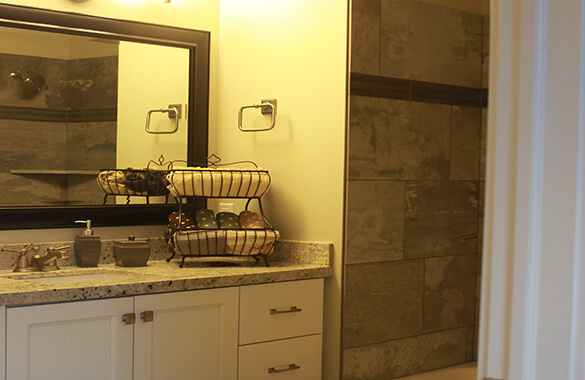 Granite, marble and slate are your best choices. Granite is the hardest, making it resistant to scratches. Do you want to add texture through a stone accent that is creative and unique? Choose a rough, porous stone such as pumice to intersperse throughout your smooth stone design. Would you like the stone texture you add to come from a stove that retains heat well, gradually releasing the heat from its walls into the room? Look for stoves made of soapstone. These stoves provides gentle, even heat and create a cozy atmosphere. The stone’s polished surfaces and natural patterns add interest. 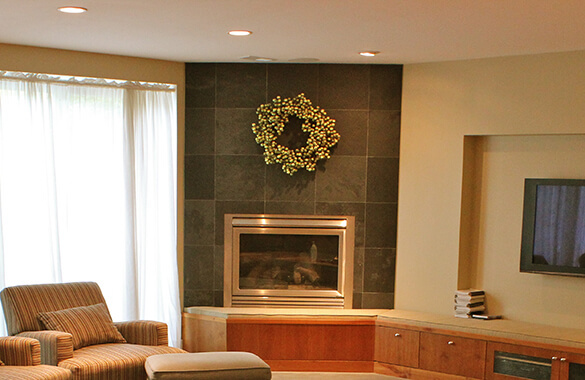 Have a cozy fireplace in your basement vision? Soapstone, granite and marble are possible choices. Soapstone has the most stable composition and the highest ability to withstand high or prolonged heat and rapid temperature changes. Any stone that has water or air trapped inside may explode when heated. 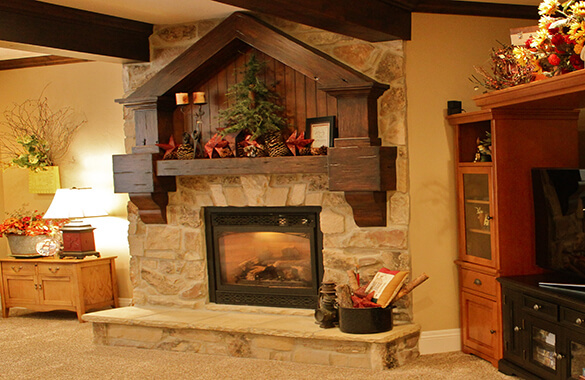 Stay away from limestone, sandstone, and other soft or porous types of stone if you are building a fireplace. River rock also may be dangerous because it sometimes has water from ancient times trapped inside. Stone is heavy. Be sure you have adequate support underneath and behind the stone you use. Stone veneer made from thin slices of natural stone secured to paneling is easier to install and quite a bit lighter in weight. You also can choose artificial stone veneer made from manufactured stone. Use sealant if necessary. If you add texture to your floor through the use of sandstone, likely it will have a honed surface that is smooth yet porous. Be sure to protect the surface with a sealer that penetrates the pores and is not slippery. Protect your stone floor. The polished or glossy surface of a granite or marble floor will wear away over time if not protected from heavy traffic. You may want to add doormats and throw rugs with non-skid backings to complement the floor texture and protect the stone. Also, make sure the stone surface itself is not slick. One last unique way to incorporate stone into your basement is by installing one of Rockwell’s decorative window well liners. Adding one of these decorative window well liners adds an aesthetically pleasing view as well as a stone texture that looks and feels real. Rockwell’s decorative window well liners are sure to be a great addition to your basement. With a bit of preventive care and some dusting or other cleaning now and then, the stone textures you install in your basement, including those in your basement window wells, will look new and be a source of pleasure for years to come.